Has your swimming pool lost its luster? If the pool that was once sparkling and brand new now looks like it’s about to crumble, it’s time to give it a facelift, inside and out. While just the thought of taking the plunge may be overwhelming, with the information below, you’ll be enjoying your updated pool in no time. If you are thinking you can’t afford to revamp your swimming pool, on the contrary, you may not can afford not to. Pools that are not rejuvenated from time to time lose their value. They also begin to need costly repairs that a simple upgrade could have prevented. The more you put into you pool, the more you’ll get out of it. The best thing is that it doesn’t have to cost a lot of money, or time, to make some small changes that will make a huge difference. Or, you can dive in and remodel the entire pool inside and out. Regardless of how deep you decide to delve into the project, you’ll want to start out by learning all of your options and what they each entail. You might be shocked at how such a simple upgrade on your pool’s lighting and fixtures can add amazing appeal to your pool. In the event that your pool doesn’t have any lighting at all, you’re really going to love the changes. Where flood lights were once the hot item for pools, all that has changed. Lighting is now much more dramatic. They can illuminate landscape or focal points, add color underwater, and set most any tone to your pool area like romance, relaxation or even a retro feel. You can even add them to your water fountain, hot tub, or laminar jets. Talk about bringing your pool into the 21st century, if you’ve been living in the Stone Age without pool lights whatsoever, you’ll really like being able to swim after dark. You’ll be shining a light on safety too because if children are swimming after dark, you’ll be able to keep a watchful eye on them much better. The unspoken rule about pool lights in the pool is that if you have a dark finish, you will want to choose lights that are brighter and whiter so they’ll show up better. Medium to light finishes can handle lights with more color. Lighting sets the mood inside your pool too. You can choose between those that vibrate energy or those that are more aesthetic in nature. Colors can reflect the scene you wish to set too. You’ll have a myriad of choices so you can choose the option that best fits your taste and your budget. While generally, lights for the actual pool area that will be underwater are installed when the pool is being constructed, they can also be added during a renovation. They are affixed in place with concrete or gunite. Modern options are now available as well that are niche-less so they can more easily be installed as an upgrade. The process is much less expensive than gutting a pool to go back and add lighting and fixtures too. If you are wanting to add a clean bright light, you can opt for incandescent lights. They are very economical. The face rings surround the actual bulb and can be made to blend right in to the finish of the pool. Replacing the bulbs does require an electrician or pool technician who is certified though. LED lights are energy efficient because they emit much less heat and they last over twice as long as traditional bulbs. LEDs can create a light show by rotating colors. They can throw rays of light across the pool as opposed to one blinding beam of light. They are also available with special effects lighting features called celestial floor lighting that can do amazing shows like projecting stars across the water, images of fishes swimming all around, or fireflies dancing in the water. The lights simply thread into an inlet fitting which requires no fitting or bonding so adding this type of lighting feature to upgrade your pool is not near as expensive as it used to be. They can be changed without even draining the water. Light sculptures and fixtures can be strategically place to glow within greenery and even in and around trees and grassy areas to add a dramatic effect. Party lights can be strung for a festive feel too. Even the fixtures of these lighting options are decorative. Landscape lighting is a quick, easy, and affordable way to wake your tired pool area up! Be sure to have an expert in pool lighting do the work. There are codes that must be abided by for safety reasons. He can also consult with you on the lighting that is the best fit for you. If your pool decking has seen better days, you certainly want to repair and remodel it. Failing to do so can lead to major, expensive problems. Plus, someone could stumble and get hurt from wood that is popping up or stones that are cracked. In the event that you don’t have decking yet, it’s a great way to give your pool area a brand new look. The choices are almost endless when it comes to materials you can use and ways you can use them. A deck can add aesthetics, comfort to your feet, keeps you from slipping, and repels heat from the hot sun. Concrete is always a trusty standby. It’s both durable and economical too. It isn’t your grandparent’s old concrete anymore though. These days, pool deck concrete has many features such as being heat and slip resistant and being super comfortable to walk on. Even the texture on it is down to a fine art. Concrete can be textured, broomed, or stamped. The drawbacks to traditional concrete are that it can crack over time, it is slippery, and it is not very practical to add on to. Newer types of concrete came about as solutions to the problems. Textured concrete is not so slippery. Stamped concrete made adding on and repairing less detectible. Modern concrete also lasts much longer and is less likely to crack. Pool pavers are interlocking pieces of brick, stone, aggregate, or various other materials. They are ideal to use as an alternative to concrete decking. They can help minimize slipping are available in tons of design schemes so you can have your choice of colors, sizes, and shapes to create any type of mood, feel, or theme you’d like. They can be arranged to look like cobblestones or can be made into designs too. Whether you want an elegant theme, a modern look or a more natural appeal, you can achieve most any look with pavers simply by the color, material, and pattern you choose. Pavers are durable and affordable in that if an area is damaged, a single paver can usually be repaired. In the event there is a pool leak, fixing it is much less expensive as well because you won’t have to tear up the entire deck. Travertine is a type of limestone that is deposited in nature by mineral and hot springs. It comes in cream, white, tan, and rust colors. It is a porous material that serves many purposes for a pool deck. It is stays cool even when the sun is beating down on it. It isn’t slippery. And…it looks very natural. Updating your pool with Travertine is an excellent choice. You can match it to your coping to bring out the desired effect you’d like in the area. If your pool is dark, you can go with a light Travertine for contrast and vice versa. Furthermore, you can choose your style of Travertine such as honed, tumbled, or brushed. Travertine is a very popular choice when it comes to pool decking with very good reasons why. Wood decks are timeless. The possibilities of what you can do with wood are endless. There are tons of types of wood and benefits to each. You can go with pine as an economical choice or cedar for the fact it looks great and repels insects too. Redwood is a classic. The patterns you choose can accomplish any decorating scheme you have in mind. From a rustic look to a modern effect, you can get it all with wood simply by the placement of it. You can add other wood pieces to the scene too like a walkway, wooden bench or table. Repairing wood is usually economical. It often just requires replacing a plank or two. Wood can be as expensive or inexpensive as you need it to be. Just choose between what you like and what fits your budget. Adding wood can be done in intervals too. It will certainly serve the purpose to instantly spruce up your deck. Brick decking is more unique than some of the other decking materials. Bricks are glamourous, sophisticated, and classy but can also achieve a rustic or masculine look. There are a multitude of types of brick you can use like red brick, clay brick, and natural brick. They are economically beneficial because, like pavers, they can be individually replaced as needed without tearing the whole deck up. They can be smooth which is comfortable to walk on but have enough texture to prevent slips. Just imagine the new look your pool area would have with a brick deck. You can even start small and add more on later if that best suits your pocketbook. Whether you’re repairing and remodeling the one you already have or adding one where there once was none, you really can’t go wrong when you deck out your pool. You’ll bring a whole new look of your choice to the area. Coping is the material around the edge of your pool. It is mounted on the bond beam. It can be made of tile, brick, or a number of other materials. If you already have coping on your pool, you’ve probably noticed it cracks, chips, and fades over the years. 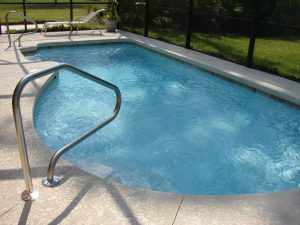 It is imperative that you repair any faulty coping or your entire pool structure can become compromised. Replacing or adding coping is a perfect way to give your pool a facelift. It is good for the structure of the pool and adds aesthetic value too. It can actually transform the entire look of your pool area. The type of coping and the pattern can be designed to create any mood you would like. It is important that it be installed properly so your pool doesn’t leak, especially when the pool shifts like in cold weather. You will want to keep it clean too so it doesn’t develop an unsightly ring around it. Coping is one of the fastest ways to rev up the excitement of your pool and to revive the look and feel of a pool that has grown weary over time. When you go to update, you might as well make improvements that will save money too. Adding a new, energy efficient pool pump is one of the wisest revamps you can do. The prices of new pool pump vary as do the savings you’ll enjoy from it. Some units sell for as low as $1000 and can make a big difference in your electric bill. Calling different pool companies or going online to check what units are available and the prices on each is the best way to approach the idea of getting a new pool pump. A fabulous new invention for pools is the automatic leveler. This device fills the pool up to the desired level and then automatically shuts it off once evaporation causes the level of water to drop off. For $500-$700 you can have a new and efficient automatic water leveler. It does require installation by a professional a pool contractor who will run an underground line so he can tap into the spigot for outdoor water supply. For the little money spent, this update will pay off for years to come. On warm summer nights or cool evenings in the fall and winter, you’ll get much more use out of your pool if you have a firepit to enjoy. There are several different types of pits like gas, electric, and wood burning ones. You will find a number of choices on both the look and the function of them. Adding a fireplace style of firepit is one option. It is a relatively inexpensive addition that can serve a variety of purposes. They range from several feet wide to 6’ or more and can be found in pre-fabricated styles or even old fashioned clay pits. The design can accent the tone you are setting at your pool such as a natural gas or propane pit is more modern than the clay pit which would accomplish a more natural and relaxed feel. If you are getting a firepit installed or bring a pre-fab one in yourself, you will also want to consider seating. You can opt for chairs of any type and maybe a table too. Or, you can have seating built in that circles around it, like a wooden or cement version. Accent with overstuffed, matching cushions and throw pillows too. Make sure the fabric is waterproof and for the outdoors. Fire pits are very relaxing to look at and will keep you warm too. Imagine seeing the reflection of a fire in your pool. That is sure to give your pool area a new flame. This is what dreams are made of! A beach entryway to your pool will give it such a new look, you’ll swear it was a brand new one. Talk about serenity! With a beach entry, you simply wade out into your pool like you were wading in the ocean. There’s a slopped walkway that you’ll stroll down or, sit your chair on it for the perfect cool sun tanning session. There are plenty of styles to choose from in beach entries. You will want to match or blend with your pool features. If you are considering new coping or resurfacing the deck, it is good to do the entry at the same time, but it isn’t mandatory. The beach entryway will definitely give your pool that much needed update and will add the perfect touch to get you back in the pool instead of closing the indoor curtains just so you don’t have to look at the dilapidated monstrosity. In fact, you’ll be so proud of it, you’ll want the world to see. Why not turn up the volume to your pool by updating with a new entertainment center. Your friends and family will love joining you for poolside movies and shows. Your pool will never be boring again. You’ll want to invite everyone over for movie night. This project can be done very inexpensively by just adding the television and hooking it up or you can go all out and get the super elite television model, surround sound near the pool, invest in some theater seating floats (well, if they make those), and you can even build a gazebo for the television to sit in. If you opt for a top of the line television with all the bells and whistles for your viewing pleasure, you’ll want to have a professional hook it up and set up the sound too. The moisture created from the pool and the splashing that goes on around the pool isn’t exact ideal for the electronic aspect of the scenario. But, a poolside theater system will definitely add action to your aging, lifeless pool and that is what it’s all about with this revamping idea. Are you a sun bather? Studies are proving that getting sun is actually healthy. A Baja shelf, also known as a tanning ledge, is a nice size, shallow surface that is flat and usually runs about 6 inches deep with water. Resort pools often have a Baja step because they are beautiful. It adds aesthetic value and is nice to use. Plus, it helps you get your dose of sun while comfortably cooling off. Baja shelves cost a little over $2000 on average which is very little for all they add. It’s a good idea to resurface your pool at the same time if you are planning to take that measure in the future so the steps and surface all flow together. This is one update you’ll enjoy time after time. You’ll love lavishing in the sunshine and relaxing on the shelf even after the sun goes down. It is a luxurious addition and it will make your pool look like it cost a fortune when really, it didn’t. By updating your dilapidated swimming pool inside and out, you’ll also revive the life of the pool. Not only will it be more efficient and valuable, it is less likely to have damage that can end up in very costly repairs. Perhaps the best thing is though that your pool will come to life in another way too. You’ll no longer cringe when you think about it. You won’t be finding any more excuses to offer when friends and family want to come take a dip. Instead, you are likely going to be throwing pool parties like you used to and finding reasons to get in the pool rather than to avoid going near it. Pools are to be enjoyed. They are excellent for your physical and your mental health. They are social hubs for people to gather to make memories. The cost of updating your pool is just a drop in the bucket when you consider all it gives back in return that is priceless. Don't forget to check and follow us on all major social media networks. Just click on an icon below to go to our social media pages! Job done as expected in time and as planned. © 2016 All Seal Exteriors / KP Ventures, LLC, All Rights Reserved | Designed by PKZ Media, Inc.